For those who remain unaware of it, Crackle is neither a Rice Krispies wanna be nor the new sidekick of the longstanding Hershey brand candy bar. Matter of fact, free, advertiser-supported Crackle has been around since 2007, when Sony Pictures Entertainment launched it as a re-brand of Grouper. Still, it’s been pretty slow-going on the consumer awareness front. Crackle became available on Roku and other streaming devices in 2011 and made its first sizable imprint in the summer of 2012 with Jerry Seinfeld’s critically praised Comedians in Cars Getting Coffee. But in the years since, pay-per-month Netflix, Amazon and Hulu have continued to set the pace in the growingly competitive world of Internet streaming media. Crackle has responded feebly with originals such as Sports Jeopardy! and (urp) Joe Dirt 2: Beautiful Loser. Its latest effort is far more ambitious and also the first time Crackle has mounted an original drama series. The Art of More, which on Thursday began streaming all 10 Season One episodes, is high on production values but low on basic believability with its discombobulated tale of two very amoral New York art auction houses. Put your Monet where your mouth is, and let’s hope it’s not stolen or forged. Vying for Brukner’s business are two young gun auction house connivers without any compunctions about how they make it happen. 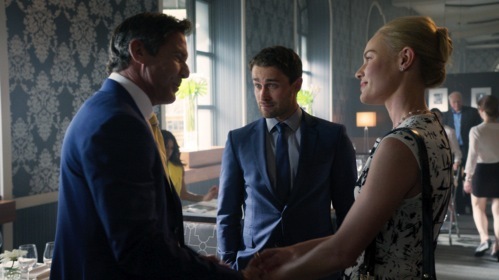 Even so, icy Roxanna Whitman (Kate Bosworth) of DeGraaf is a walk in the park compared to Parke-Mason’s cocksure Graham Connor (Christian Cooke), whose real name is Tommy. During the Iraq war, he got involved in art theft and smuggling. Back in the States, Parke-Mason welcomes him with open arms after he lands filthy rich Arthur Davenport (Cary Elwes) and his imposing art collection. Meanwhile, Roxanna’s gambits include conning a dying old man into auctioning off his supposedly priceless and long-mothballed art collection. But big problems kick in when the centerpiece of this cache, a Vincent Van Gogh painting, is nowhere to be found. Amid all the gangsterland goings-on and art house double-dealings, Art of More is on firmer ground with an interesting story device that opens most episodes. Via brief flashbacks, some of the high-line items and collections up for auction are shown in their original states. In Episode 2, a substitute keyboardist for The Who stumbles upon Pete Townsend’s written lyrics for “Won’t Get Fooled Again” during the band’s 1969 concert in Lake Geneva, Wisconsin. Episode 5 begins in Antarctica, circa 1912, when an expedition party led by Robert Falcon Scott eventually was claimed by the elements. His journal and attendant belongings now command heavy prices. Quaid involves himself fairly heavily in the overall proceedings, playing against type as the “impossibly egotistical” Brukner. He clearly savors this role, sometimes sounds like Jack Nicholson and is fun to watch in small doses. Elwes, on the other hand, is for the most part ridiculous as the snooty Davenport. But he’ll always have The Princess Bride and Robin Hood: Men In Tights. Season One of Art of More ends very open-ended, with Connor sinking into even deeper depths of misery and criminality while Brukner makes a drunken spectacle of himself during what’s meant to be a triumphant party he’s thrown on his behalf. Roxanna, whose boss is her demanding and belittling father, affixes another icy stare in her closing scene. Crackle is unlikely to set the binge-watching meter whirring with this one. Plus, it takes longer, with all those commercial breaks to navigate. Still, The Art of More seems like progress in an increasingly rough, tough streaming world. It’s at the point where we’ve come to expect appreciably more from this world than from the Big Four broadcast networks. So these can be tough nuts to crack for Crackle. Or in this particular case, tough Gogh-ing.